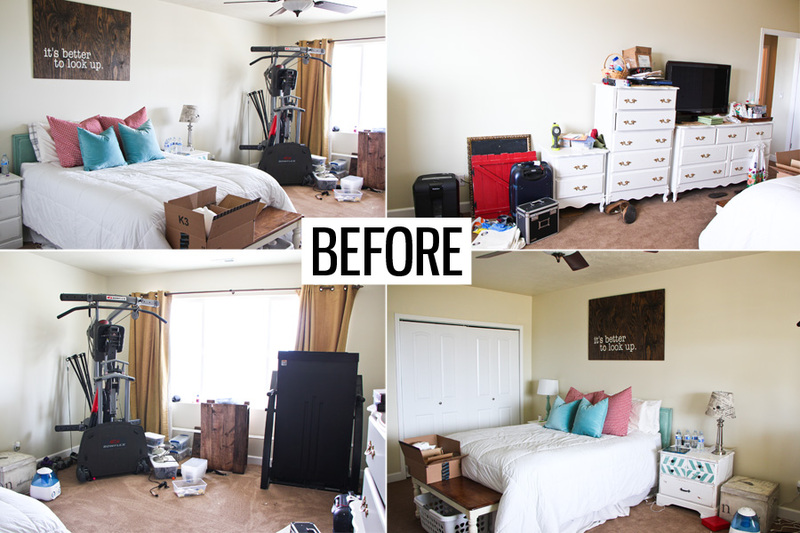 I finally did a master bedroom makeover. Technically it was kind of decorated before…meaning I had a few extra pillows on my bed and some old art on the wall. I placed a few trinkets here and there. But just look at this disaster of a room. If I could just close off the other half, then it might look okay. But the other side of the room houses exercise equipment and pretty much all clutter that ever existed. This is embarrassing to show you, but I’m keepin’ it real. 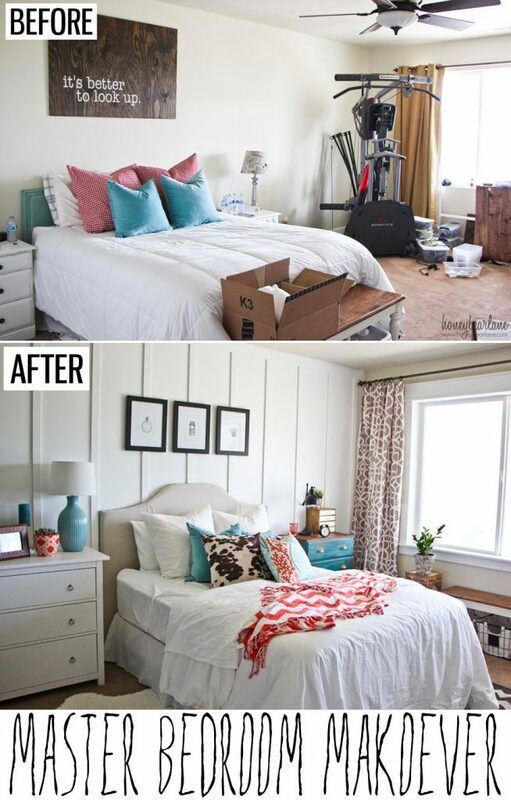 To give this room a makeover was a pretty huge undertaking. The hardest part was clearing out all the clutter! It took days to go through everything. Then I rearrange the furniture so everything kind of switched places. I don’t love how the exercise equipment is the first thing people see but there’s no where else I can put it right now. And yes, it’s not in any of the ‘after’ pictures but it’s still there. Who wants to see a Bowflex in a beautiful room picture? I mean seriously guys, check out how bad this was. Don’t you love how three dressers are shoved next to each other? However I enjoy having the bed closer to the the window. We have a beautiful view and now we get to enjoy it a little better. It actually feels more like a place where we can relax and retreat from everything. After I rearranged everything and cleared out the clutter and old decor, I moved everything away from the back wall to do the board and batten. I will have a tutorial on this, although there are hundreds of tutorials out there, there’s always a new take on a project. This took a long time to complete, but it was so worth it. It made the biggest impact on the room. I also trimmed the window in a craftsman style trim at the same time. After the wall and trim was painted and dried, I put together a headboard really quick and pushed the bed back. I also had this junky little dresser that I got for $5 at the Restore that I transformed into this gorgeous side table dresser. I will have another post about that as well. I adore this color! After I got the new side tables in, I had room for an armchair in the corner and a bench. This is nice to provide some other places to sit (or drape clothes on if you are my husband) and make it feel more homey. 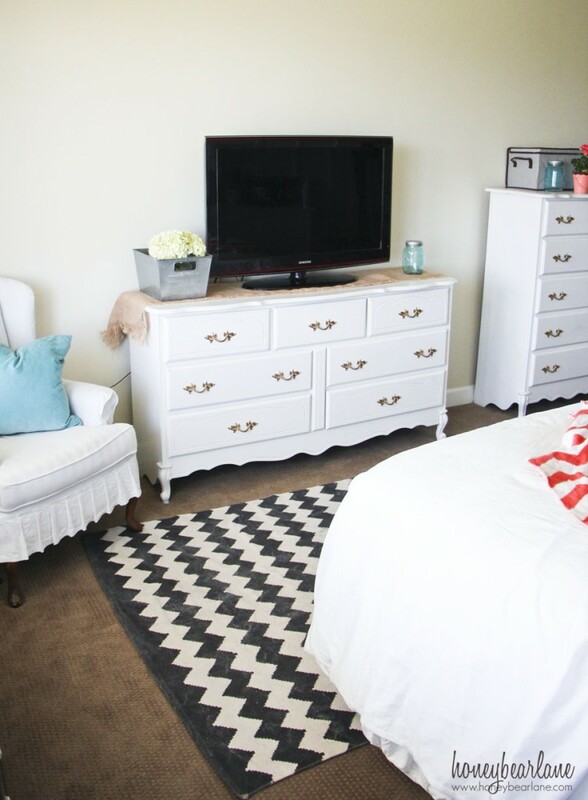 And my chevron rug found a new home (it’s been floating around my house.) I got that at Urban Outfitters last year. Under the bench I stored some of the cute wire baskets where my husband is delighted to store his shoes. He is not one to be super on top of putting his clothes and shoes away, so I figured having the baskets right here makes it easy for him. That’s the key to getting husbands to do stuff–make it as easy as possible. I have been searching for the last few years to really define just what my style is. I love the beach style, but not 100%. Same goes for farmhouse and modern. I love elements of each style, but I could never commit to just one of them. I love them all mixed together. And in this room, that is what I think I got. Beachy Modern Farmhouse. I love aqua and turquoise so much that it is basically a neutral in my house. I also wanted to branch out a little with color and try some coral-orange accents. 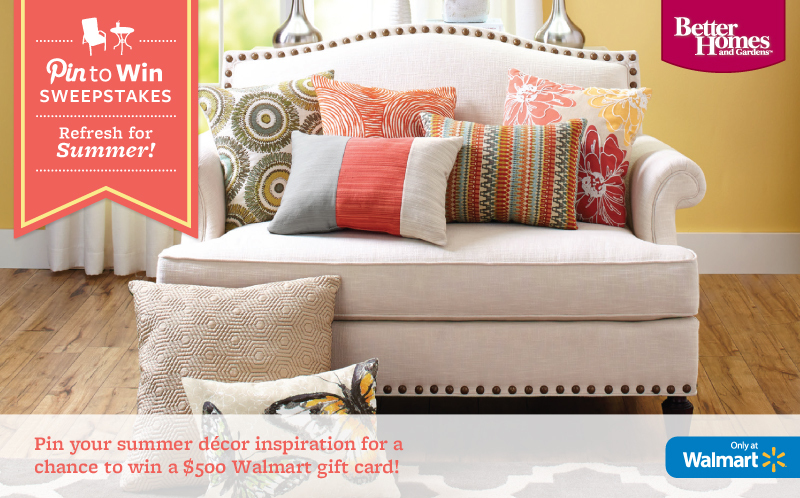 For the decor, I picked out several items from the Better Homes and Gardens line at Walmart to accent the room. 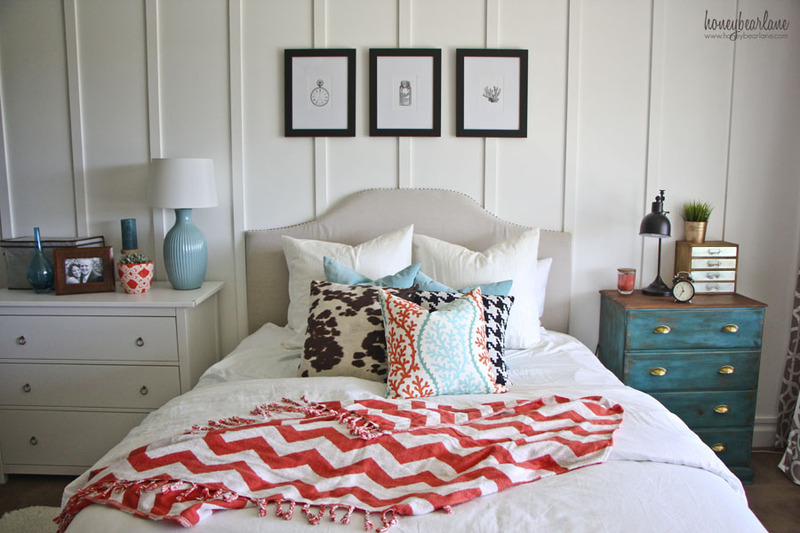 The two lamps on either table, all the storage bins, the sheets on the bed, the frames, and two of the throw pillows. The bench is also actually a BHG item that I got last year and re-stained the top to match my other wood. A few other pieces I picked up at World Market and Home Goods. 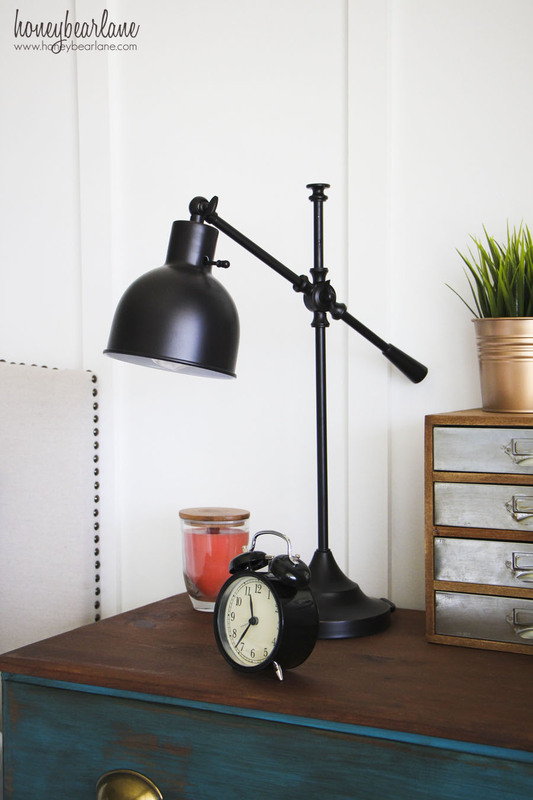 This task lamp is one of my favorites–the black is a fun accent and somewhat masculine but fits in with a rustic farmhouse feel. The other lamp is more feminine, which plays off the male/female sides of the room. I filled the frames with prints I found from the Graphics Fairy. I chose a clock, a Mason jar, and some coral. These also captured the modern beachy farmhouse feel I was going for. And the BHG frames are so classic with the thick mats making it seem very polished artwork rather than things I printed off my computer. 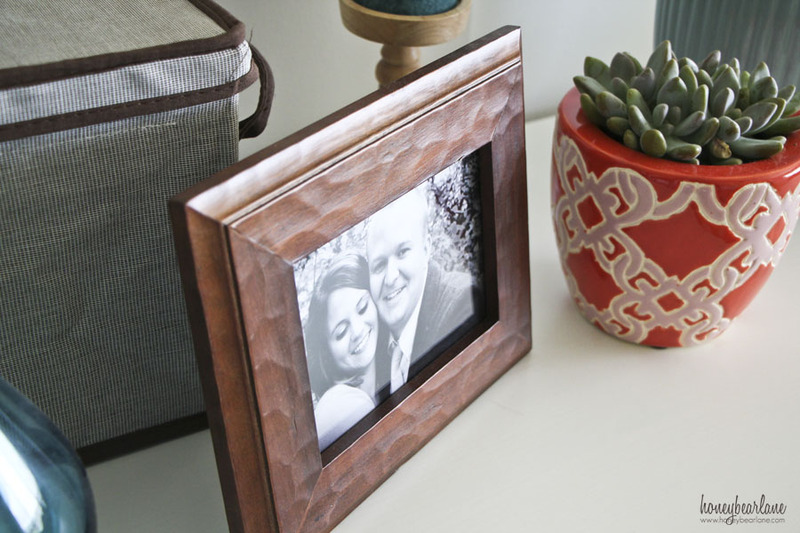 I also love the more rustic hand scraped wood frame that sits on my night stand with a cute picture of my husband and I.
I can’t even express to you what this new room means to me. I feel like it finally made me a real designer…like I finally figured out how to capture and portray my style. Now it’s a room I’m proud of, a room I want to spend time in, a room that makes me so happy because it’s such a perfect space. Now I want to make my bed. I want to cuddle up with my babies and watch Daniel Tiger over and over. The BHG sheets are super soft and cozy and my bed is just a haven of relaxation. 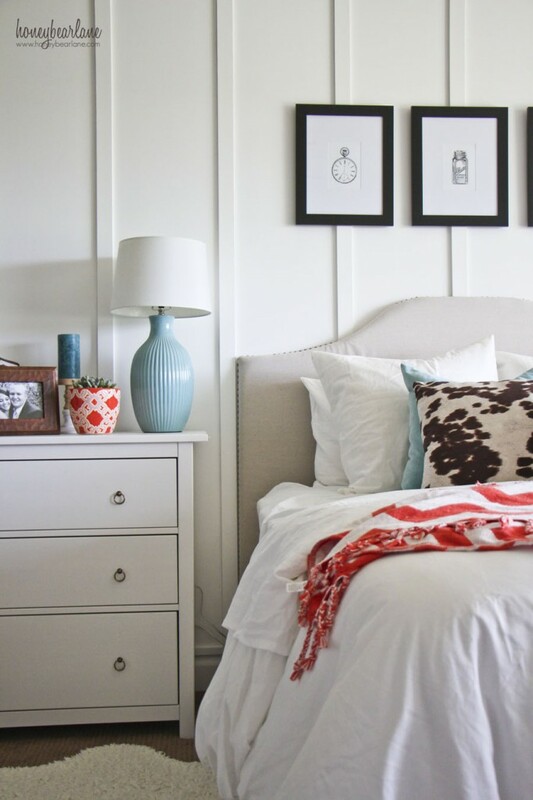 Stay tuned for many tutorials to come–board and batten, dark glazing a dresser, headboard, and how to bring your room all together. 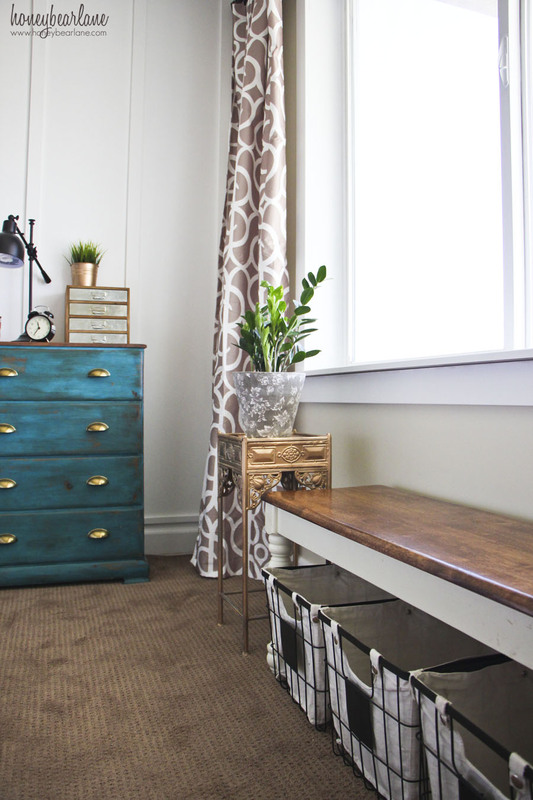 I’m participating in a Better Homes and Gardens Room Refresh challenge–and you can see all the other participants’ rooms in the Refresh for Summer Pinterest board. And if I get the most repins on my room, I will win the challenge! So please if you feel so inclined, go repin directly from the board. Thanks friends! I wrote this post on behalf of Better Homes and Gardens Live Better, received compensation, but all opinions and statements are my own. OOOOH! I just love the makeover – – GREAT job!!!! The wire baskets are awesome! Where did you happen to find them? All the storage bins are from Walmart–the Better Homes and Gardens Live Better line! If you can’t find them in the store, they have them online! What an amazing transformation! I love the beachy eclectic feel, and thanks for being honest about the exercise equipment still being in the room! Keeping it real! I’m recently obsessed with board and batten. I’m trying to put it on my own house right now, never thought about bringing it in the house. Love the update, and I also can’t really commit to one style. I’m trying to figure it out right now. Good luck! You can’t go wrong with board and batten imo! I absolutely love the look! 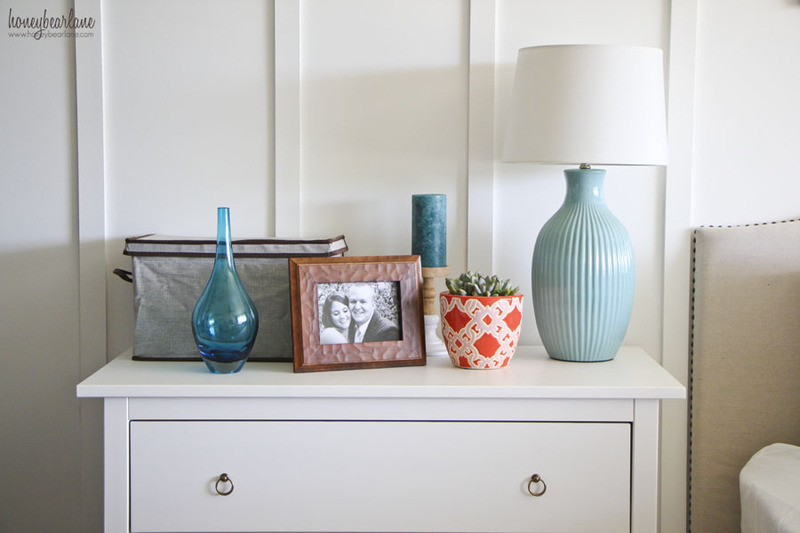 Like you, teal is pretty neutral through our house and your style is SO the same as mine. I’ve tried for years to find my style so that I could showcase it in our master as well and I haven’t quite made it to that point yet. You’ve given me a lot of ideas though! Thanks! Thank you! 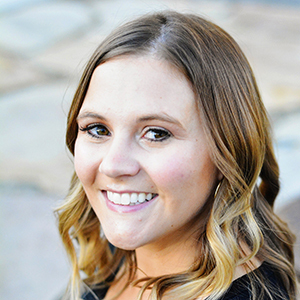 I hope you can get your house looking the way you want it! Makes such a difference to me! I’ve searched BHG products at WalMart and can’t find the chevron pattern throw on the bed. Beautiful makeover! Love the pops of color!!! Thanks Debbie! It was so fun to meet you this week! The board and batten behind your bed makes the whole room look so much taller!! 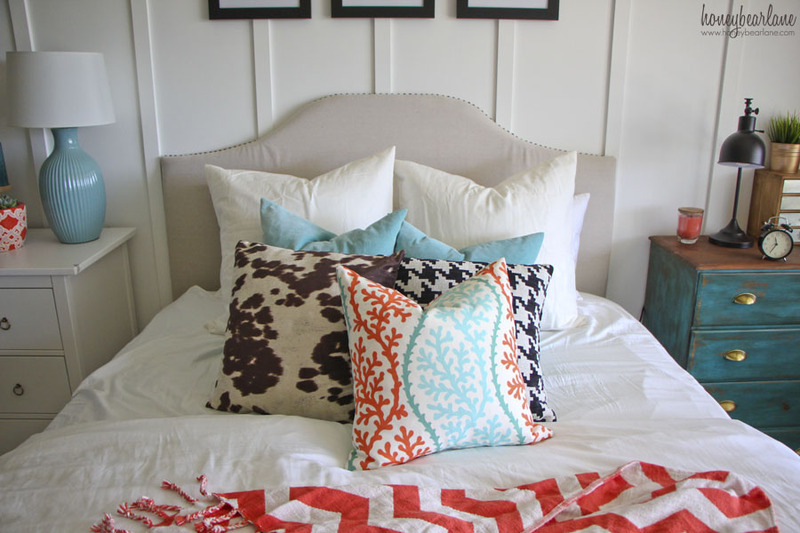 I love all the different pillows on your bed! Your bedroom is beautiful! Hello, do you recall the wall color? You have a great eye for color. The room is blended so well. The white? It is actually just Behr brand unmixed white. The rest of the room I am not sure since it was a rented apartment.